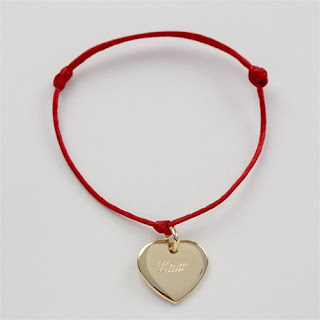 I have another treasure to tell you about today- French Charm Bracelets from LilyMe. I think you will love them just as much as I do! So pretty! Parisian-born Gaelle introduced North America to one of the hottest jewelry trends in Europe, the personalized charm bracelet on a colourful satin cord. Her US friends fell in LOVE with the bracelets which prompted Gaelle to start her own business, LilyMe, designing these fantastic bracelets. LilyMe has a gorgeous collection of charm bracelets, necklaces and chains, and charms. What is great is that you can personalize the charm to make it even more meaningful to you or as a gift for someone you love. Their charm bracelets have a colourful satin cord and either a sterling silver or gold plate charm that is engraved to suit your desire. This is one trend that is really catching on with both moms and teens! LilyMe sent me the 1 Hanging Heart Charm Bracelet in Sterling Silver with a Light Pink Satin Cord and engraved with my name “Stacie”. I received size medium which fit me perfectly. There are slip knots on the cord in case I need to adjust it. I was struck by how soft and pretty this dainty bracelet was. It is so pretty and feminine- I love it!! It looks great with the casual outfits I wear on a day-to-day basis. I have had numerous people ask me about it and commented how simple yet beautiful it is. I love how it is personalized just for me! The charm fits up to 9 letters so if your name is longer than that, you will need to use a nickname. It is reasonably priced at $38. 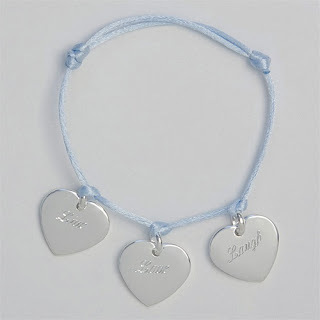 I could see my daughter, Olivia, wearing this bracelet and it would make a great gift for her birthday. Check out the LilyMe Collection and see all the other stunning pieces they have.